Inspired by a wonderful mid-summer dinner at ici in Ft. Green, Brooklyn, and the contents of this week’s CSA box, I decided to make a polenta/summer squash dish. Polenta is a quick-cooking and versatile pantry staple. Polenta works great as a base for fish or veggies, and in this case I topped it with a quick saute of zucchini and yellow squash (in homage to The Red Cat’s pecorino/almond/zucchini dish). Polenta: Heat the milk and water together in a medium sized saucepan. Just when the milk/water begins to boil, whisk in the polenta and turn down the heat to low. Stir every few minutes and cook for 15-20 minutes. If it gets too thick, add more milk or water as you prefer; the polenta should be thick, but not crunchy. When the polenta has cooked, add cheese and season with salt and pepper. Squash: Shred zucchini and squash in a Cuisinart or on a box-grater. Heat 2 Tablespoons olive oil in a large pan over medium-high heat and saute garlic for 30 seconds until golden. Add shredded zucchini/squash, season with salt and pepper and cook for 2-3 minutes while tossing to coat. Egg: Heat 2 inches of water in a small pan. When the water boils, add the vinegar and salt and turn heat down to low, so that the water is just barely simmering. Crack an egg in small bowl and gently slide the egg into the water. Do the same with the other egg. Set a timer for 3 minutes. The egg is perfectly cooked when the white sets and the yolk is still runny*; cook longer for a harder yolk, or shorter if you like it mad runny. When done, remove from water with slotted spoon or spider, and drain on a clean kitchen towel. 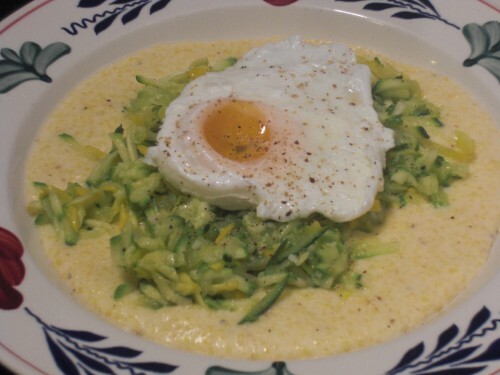 Serve: Layer polenta at the bottom of a shallow bowl, then add about 1/2 cup of the zucchini/squash, then top with egg. Season with salt and pepper. *Mishap alert: While attempting to poach the above egg, I didn’t put enough water in the pot, and therefore the yolk didn’t glaze over like I would have liked. It came out more like a mix between a poached and sunny-side up egg. It still tasted delicious, though, and that’s all that matters. For another polenta recipes check out this polenta casserole from Matthew. Polenta + poached egg?! Yum!!! It is a very nice combination—worth a try!